Dustin Pacheco, was born and raised in sunny San Diego, North County native. He is a family man with a strong passion for art and motorcycles. Dustin is a naturally talented artist, from an early age he worked with acrylics, colored pencils, paint markers, airbrushing, and graffiti. 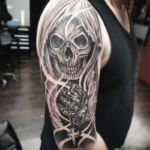 He started his professional tattooing career in 2006, at just twenty-two years old, young and ambitious. 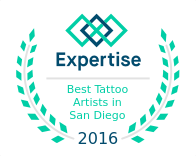 After working in several other tattoo shops throughout San Diego, he joined the SD Tattoo team in 2016. 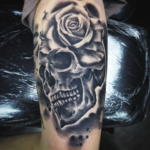 Dustin has over 12+ years of experience as a professional tattoo artist, this has given his the experience to be the well versed artist he is, experienced with most tattoo styles. 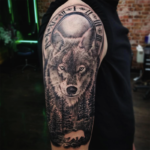 He pay’s close attention to details and continues to learn, excelling in black and gray lettering, color bomb, new school, and realism. 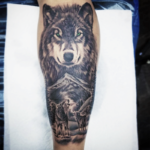 Dustin can create just about anything you can think of, offering fully customized tattoo designs for each client. 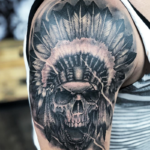 He has an outgoing personality paired with a dedication to creating the perfect tattoo for the client. 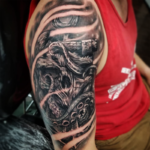 To schedule a consultation or tattoo appointment with Dustin, please call the shop or use the website contact form and our scheduling manager will get you set up with an appointment.